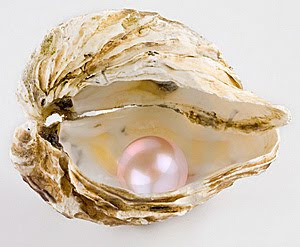 Natural pink pearl nestled in oyster shell. 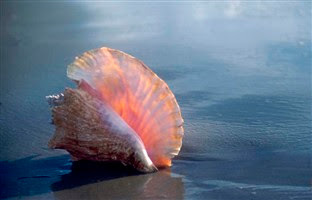 Queen conch shell, brilliant in its sunset interior. 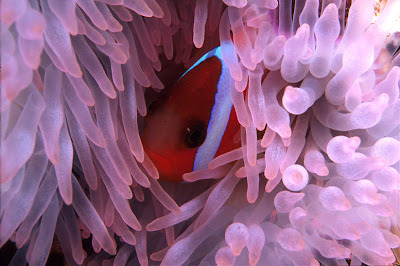 Sweet clown fish hiding among a neon pink anemone. I want to know what you ache for and if you dare to dream of meeting your heart's longing. It doesn't interest me what planets are squaring your moon...I want to know if you have touched the center of your own sorrow, if you have been opened by life's betrayals, or have become shrivelled and closed from fear of further pain. I want to know if you can sit with pain -- mine or your own without moving to hide it or fade it or fix it. I want to know if you can be with joy -- mine or your own, if you can dance with wildness and let the ecstasy fill you to the tips of your fingers and toes without cautioning us to be careful be realistic to remember the limitations of being human. I want to know if you can live with failure -- yours and mine and still stand on the edge of the lake and shout to the silver of the full moon, "Yes." Hello beautiful friends. I may not be blogging daily at this moment, but please know that I am thinking of you all. As noted in my last post, I have much that I must address right now and have had to "tread water" with some of the things I adore...this blog being one of them. I'm making headway and hope to be back posting on Monday again. I want you to know I have missed your funny words, bittersweet stories, hilarious adventures, glorious photography and most of all the creativity that each of you so willingly shares with the blogging community. I wanted to share "The Invitation" with all of you. The Invitation was a declaration of life by Oriah Mountain Dreamer and how she wants to live it with others and one of those small book titles that caught my eyes many years ago. It stopped me in my tracks and had me gasp, "Wow." If only I could express myself in such a powerful way. Her book is an interesting read, although I found I did not agree with her choices based on her "Invitation." I felt they conflicted, however, it was that declaration that captured my heart. I was thinking about all of you and how much I missed reading your postings when my eyes came across her book on my table and so I share her Invitation with you. 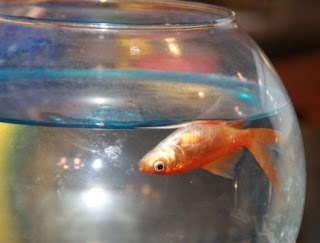 Yup, this is one of those days where I am feeling like a fish... belly-up. Of course, it is all my own doing and now I am dealing with the consequences of my own actions. I have a tendancy to take on more than I should. My honey often says I have oars in many oceans and he is correct. 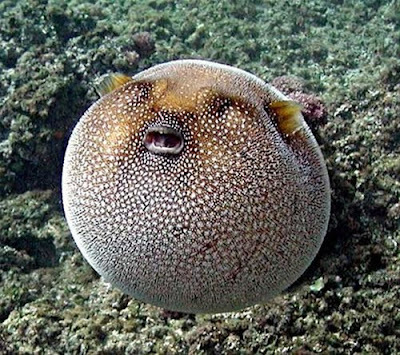 About once or twice a year I realize I have taken on too much and it then overtakes me...which makes me feel more like a bloated fish with all of the activities and responsiblities I have piled on myself. So, between preparing income taxes for family, the items I have to price and get in the shop, prepare a proposal for a website build, returning my home to its original setup following a delightful visit from family, get out birthday gifts to family, send care package to son in Afganistan, catch up on all of my blogging favorites and friends (of which I am shamelessly and woefully behind), dealing with all of the crisis's that just happened to float to the top at work (it's what happens when you herd engineers for a living) and finishing up some jewelry commisisons, I am that puffed out puffer fish. 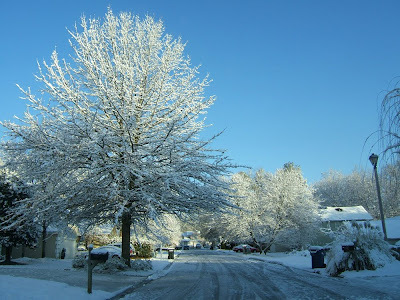 It is Ash Wednesday today as well as a White Wednesday. Go with peace to those who celebrate this beginning of the Lenten season and to all those who stop by. I changed my header out last evening with a photo I shot of a sea turtle that I came upon in the warm waters off of Cancun. He was comfortable with the divers and I was fortunate to get this close of a shot of him resting in a coral bed. 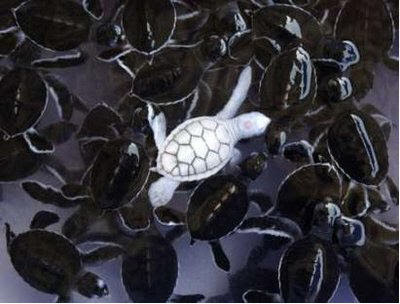 His photo got me thinking about white sea creatures and I came across these lovely photos of albino sea turtles. How dramatic and extraordinary they are. 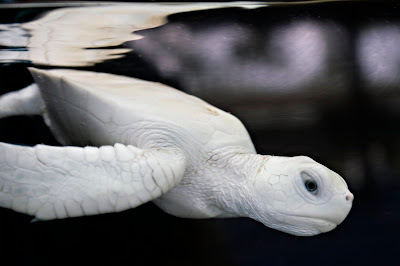 Every year around 15,000 Green and Hawksbill turtles are hatched and housed at the Thai Military Sea Turtle Conservation Center on Khram Island near Pattaya, and every so often an albino turtle turns up. 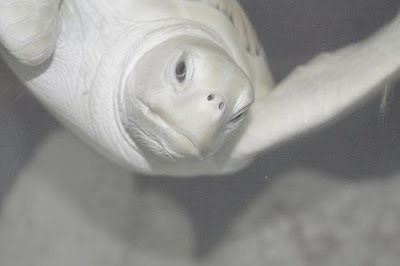 The hatchlings are kept at the Center until they’re about 6 months old, at which point their shells have hardened enough for them to have a better chance of survival in the sea. White amongst a sea of dark green, almost black siblings. Sea turtles can live to surprisingly long ages but they suffer from high mortality when they’re young. Albinos are especially vulnerable due to their bright white color. The inquisitive-looking example above top was photographed at the Sea Turtle Sanctuary at Isla Mujeres near Cancun, Mexico. Such sweet faces on these wondrous creatures. 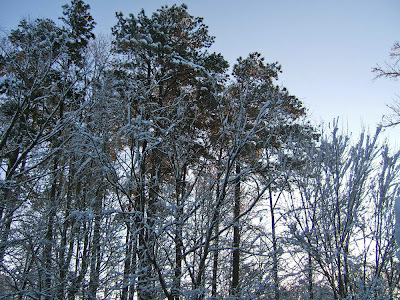 The tops of the trees from the view on my back deck. My neighbor's deck is covered in snow. 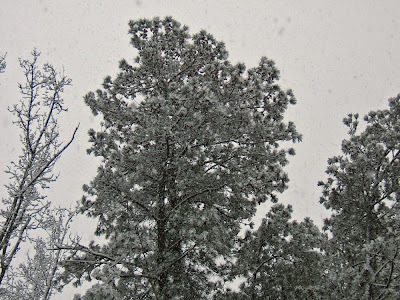 The branches on this tree are heavy with wet snowfall. Just returned from picking up family from the train station. 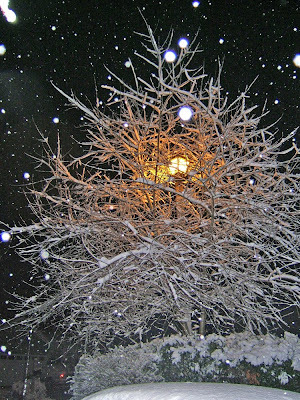 It snowed through the night and I took this shot from my driveway looking at the falling snow against the street light. 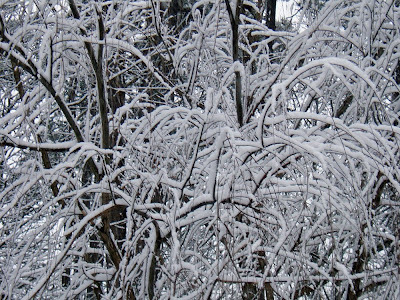 Fine tree branches become three times their size from the wet snow that would stick to them. 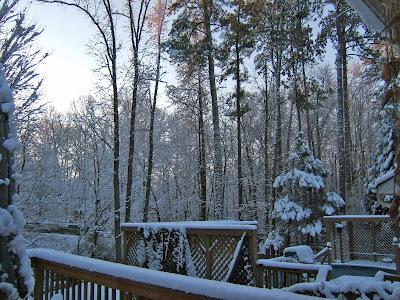 It snowed throughout most of the night. 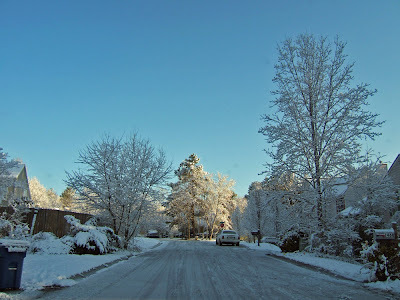 Crisp blue sky and the sound of loud, popping and crunching snow as a few 4-wheel drive owners made their way down the neighborhood streets early morning. 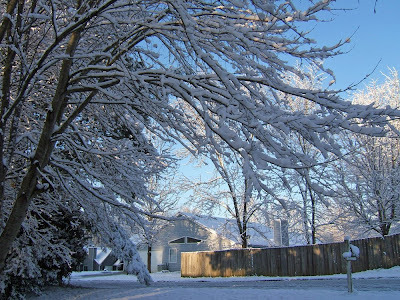 It was a winter wonderland not often seen here. This Yankee gal needed fresh bagels so I hit the streets with my vehicle and headed out. 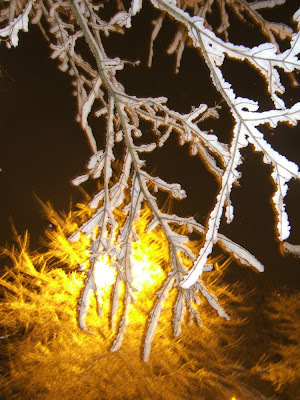 Thick ice was everywhere but bagels called so off I go. 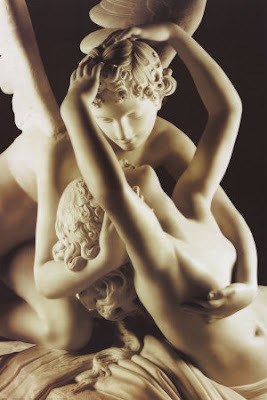 Wishing all those who stop by a Happy Valentines Day. We cannot love each other enough so tell those who mean anything to you that you love them. To those you newly meet, wish them all the best. Love, we cannot pass it forward enough. The big double doors and large picture windows are architecturally indicative of “old school” commercial design and these delightful sisters retained much of the historical integrity of the building. The extremely high ceilings, open brick walls and the sound of my shoes on old flooring brought an immediate smile to my face. Yes, I admit it, I shamelessly romanticize old buildings. I love the look, the sound and the smells of these old boys as I can feel so much of the spirits that reside within. Looking down the center aisle as you enter from the front entrance of My Sisters Antiques. Exposed brick walls make a wonderful backdrop for furniture pieces and a fireplace front. Love the red tea cart with its kicky shape. Wouldn't it be fun to have this in a guest bathroom filled with thirsty towels and pretty lotions, powders and potions? So much to see, so much to buy...my wallet was retreating deep into my purse. This adorable retro kitty clock is looking for a new home and the price is right. Magnificent buffets or sideboards. Heavy Oak with waterfall drawers and I am crazy about this Victorian piece. Dark and gothic in its design. Original mirrors. My Sisters Antiques utilizes all space available so you will find many treasures hanging from the ceiling. They have lovely architectural glass windows at great prices. And THEY SHIP ANYWHERE. My friends booth - My Vintage Heart. I rarely walk away from her space without finding a treasure or two. Susan always has the prettiest things and at fantastic prices. Lovely vintage curved china cabinet in a soft golden color. I adore vintage pottery, especially the matt finishes of the 1930s. Among the many antiques and vintage pieces you will find at My Sisters Antiques is artwork. You may select from a series of cast pieces including this magnificent moose. A great vintage print in a vintage frame. I am crazy about Sandy and if I had room in my home, this would be there. I can see all of the raviolis wanting to drop a dime in the box and going for a ride. Another lovely architectural piece. So many to select from. Even a Sea Witch can appreciate a fine cauldron like this one. Wonderful pair of Staffordshire dogs. Great color. My Sisters Antiques also boasts a huge selection of "man antiques." You know the dusty, garage looking, boy toys, old signs kind of stuff that men always gravitate too. Fell in love with this turn of the century boys tool chest with all of the tools and geegaws inside. How glorious is this feed or grain box in original blue paint? Old Coca Cola serving tray and the advertising tire ashtrays found in every garage since the 1920s. I love this print of the partying ladies. 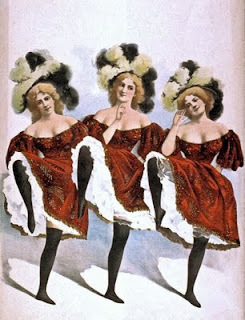 Could these be the Antique Sisters...they are certainly pretty enough to be? Wonderful kitchen table and matching chairs in soft butternut. 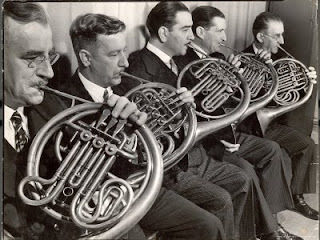 Great set from the 1940s. How clever to repurpose a vintage victrola cabinet into pretty storage space. A vintage pedal tractor in red is hung from the ceiling. Probably a good idea, because I would have loved to have taken it for a spin around the store. Lovely selection of vintage Hummels. Fun girly-girl watches and bracelets. 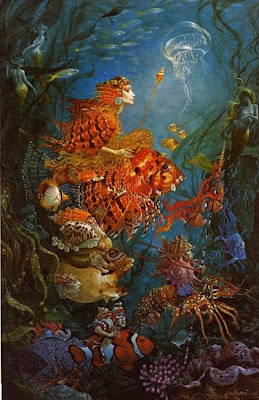 If you must keep time, why not in a whimsical and funky manner. My Sisters Antiques is a shop that is worth the trip. So much to see and the sisters encourage families stopping in. I noticed many parents with children throughout the store and the kids were delighted as mom or dad explained just what many of the objects were (i.e. old remington typewriter was referred to as an "early word processor" by a dad to his son) The kids giggled at first, but were then interested in how it worked. This type of dialogue and introduction of antiques and vintage pieces to children is priceless because we are educating our youngest generation to "our" histories. Langley Girl - is the winner of the Sea Witch in Paris Giveway! I then utilized a custom random number generator based on the number of total entries (109) and clicked the random number generator and 66 appeared. I then searched for the number 66 and it was assigned to Langley Girl. So miss, thang, I have posted a short comment on your blog today announcing that you are the winner of my giveaway. Please send me your address so I can get this in the mail to you. Congratulations to Langley Girl and thank you all of participating in the "A Sea Witch in Paris Giveway. You have all made this giveaway a lot of fun for me. Now for some wonderful news for the Sea Witch. 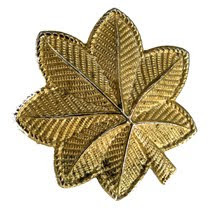 My son, presently downrange, has just been promoted to MAJOR. Yes, my son is now a MAJOR or as my delightful granddaughter now calls her daddy, " MAJOR DAD".